Thanks to the wonder of MLB.TV and its awesome clickable line-score, I took the opportunity today to check out R.A. Dickey’s second consecutive one hitter performance last night in the Mets 5-0 victory over the Baltimore Orioles. That game was Dickey’s second consecutive gem, as he beat David Price and the Tampa Bay Rays 9-1 (an unearned run in the 9th inning) on June 13, and Dickey became the first pitcher since 1988 to throw back-to-back one hitters (Toronto’s Dave Stieb). What makes it even more impressive is that Dickey is a 37 year old knuckleball pitcher who up until this year had only had 2 winning seasons, and today he sits atop Major League Baseball in ERA (2.00), wins (11), strikeouts (103), and WHIP (walks and hits per inning pitched, 0.89). 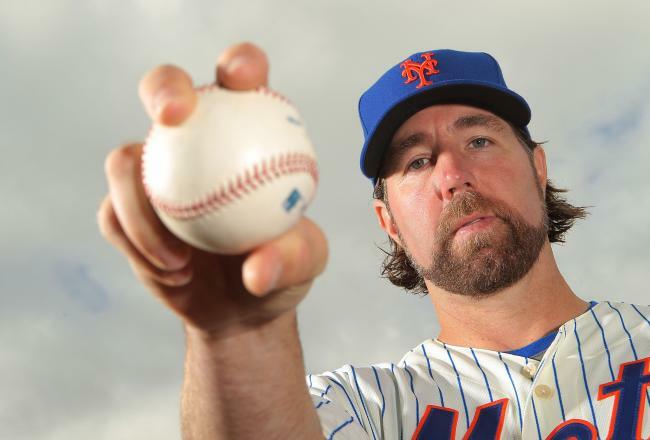 Dickey is on track to be the starting pitcher for the National League in the All-Star game in a couple weeks and has been one of the many bright spots for the Mets who currently sit in second place in the NL East with a 36-32 record. Since 1900 only ten pitchers have allowed one hit or fewer in consecutive starts (note: starts, not complete games like Dickey’s last two), but Dickey has been historically great in his last five starts. Last night the Mets knuckleballer became the first pitcher to allow no earned runs and strike out at least eight batters in five consecutive starts. He’s now gone 41 2/3 innings without allowing an earned run. Are we sure he is human? RA Dickey hasn't allowed an earned run in his last five starts...41 2/3 IP. Ridiculous. Dickey himself can’t even really explain the reasons for his recent success. He said last night, “in reality, I have a good feel for [the knuckleball] right now, making it do a couple different things”. I guess even if Dickey told the fans what he felt mechanically or mentally that allowed him to be so dominant recently we probably wouldn’t understand it, but one thing that is noticeable is that his knuckleball does have more velocity on it now than he did at the beginning of the season. Whether that’s a product of his feel for it or something that he’s been consciously working on we don’t know, but what we can tell is that it’s pretty darn impressive right now watching him work that knuckler magic. The way that Dickey has been able to make his knuckleball dance and fool hitters recently has been the stuff of legends. For the past six starts he’s been as dominant a pitcher as the major leagues have ever seen, and that’s something rarely seen from a guy who throws predominantly a pitch that is nearly impossible to control. He’s found a way to tame it. Dickey has never had a season like this, we’re not even at the All-Star break and he’s already tied his career high in wins. In the 2010 season he did have an ERA of 2.84 in 26 starts, but that is almost an entire run higher than what he has to this point in his 2012 season. And for the sake of comparison he now has a total of four complete game shutouts through his decade-plus in the Major Leagues, and Tim Wakefield (the Pittsburgh Pirates and Boston Red Sox knuckleballer) had just six complete game shutouts in his almost two decade career (all in his first 5 seasons). I couldn’t tell you why Dickey has been so impressive this year; I’m as oblivious as the rest of the baseball watching world. What I do know is that seeing him go out there and compete and baffle hitters with pitches less than 80 miles per hour is fun to watch, and if you haven’t seen him sling it this year you should give him a chance wow you as well. I can tell you this, I will be keeping an eye on his next start which will come this weekend against the Yankees probably on Sunday Night Baseball, but the Mets have been throwing around the idea of throwing him every four days and have not announced pitchers for this weekend so there is a chance he’ll go Saturday. Either way this ride he’s on has become must watch baseball and a part of baseball history. This entry was posted in MLB and tagged Baseball, Mets, MLB, New York, R.A. Dickey, Sports. Bookmark the permalink.